I am primarily known as a glass lampworker. Working with a specialized torch - a GTT Delta Elite- and borosilicate (PyrexTM) glass tubes and rods, I create blown beads, Christmas ornaments, goblets, and perfumes and solid forms, such as, paperweights, cabochons, paperweight buttons, and marbles. I am a self-taught, home studio lampworker. My fascination with glass began in the early 1970s while a student in Europe. A focus of my European studies involved the history/architecture of churches. During this study I was captivated by the magnificent stained glass windows. It was not until 1981 that I purchased my first pieces of colored glass to create my own stained glass windows. Deciding to approach the art in a different manner, I created stained glass windows pieced together with handmade wood cames instead of the usual lead cames. Feeling this process was too slow and with a desire to learn about working with hot glass, I purchased a used kiln in 1983 and began to experiment with fusing and slumping. At that point in time, I did hundreds of test fires to create a large matrix of glass compatibilities and firing schedules. Tested-compatible glass was a thing of the future. This wet my appetite for working with hot glass. I soon attended a week-long offhand glassblowing workshop. It was irresistible and I instantly knew working with hot, molten glass was going to be fun. Following the workshop, I "borrowed" a welding torch from my father, and purchased some borosilicate glass rods and tubing and began my lampworking adventure. I utilize a technique emulating the offhand process - blowing and manipulating a “gather“ of glass at the end of a glass tube or rod in a fashion similar to working a gather of glass at the end of blowpipe to form my pieces. Much later while at the Tampa GAS Conference in Tampa, Florida in 1999 I met Suellen Fowler who told me this method of lampworking is referred to as the Burton-style of lampworking. Named after John Burton. When I got home I ordered his book "Glass - Philosophy and Method". This gave "my process" validity. I developed this way of working with glass at a time when lampworking information was virtually non-existent and colored borosilicte glass was all but impossible to find, especially in the hinterlands of Wisconsin. It was not until Paul Trautman began producing colored borosilicate glass that it became commercially available. Shown below is a series of photos illustrating making an ornament with a process emulating off-hand glassblowing including working borosilicate glass with a glory hole (around 1996). Heating in the torch after applying layers of glass to the end of a tube of glass. Heating in glory hole to even the heat in the glass so it blows out nice and round. After blowing the ornament to size the top is pulled out to form the hook on the top of the ornament. Completed ornament, ready to go into the kiln to be annealed. Throughout the 1990s and 2000s making flat glass buttons for use primarily as closures for beaded bracelets and necklaces and for fiber arts, was part of my glass making repertoire. During those years I intermittently experimented with making paperweight style buttons using techniques I had developed for making marbles and cabochons. Later at button shows I began to collect paperweight buttons and to learn about their history. I began searching for information on the early button paperweight button makers, especially Charles Kaziun, Jr., who started his paperweight making career making paperweight style buttons. The information about Kaziun led me to further research on the golden age of paperweight making, 1840 - 1860.
the concept of a paperweight is easy to understand, the actual making of a paperweight is quite complex, involving the making of millefiori, forming flower forms, understanding proportions, understanding the magnifying effect of the glass cap, etching, cutting, and polishing. Paperweight making requires many steps from initial planning to final cold working. Each step of the process has its own learning curve. I also have been making my own wooden shaping tools, wooden millefiori cups, and created my own cutting setups to facilitate my paperweight making. temperature than soft glass requiring much more heat to get it to melt and move. The borosilicate glass color palate is very limited compared to that of soft glass. Many of the borosilicate colors are composed of metallic oxides that react to the flame environment (oxidation and reduction) and also can change with working time. I have also found upon re-annealing, the oxide colors continue to chane with each annealing cycle - with some pieces living in the kiln for months before I am satisfied with the development of the color. The oxide laden colors also affect the adjacent colors, another attribute that must be taken into consideration. Numerous people have suggested that I should turn to soft glass to make paperweights but I appreciate borosilicate glass's remarkable qualities that allow me the freedom to create with it in my own way. I continue to be intrigued with the paperweight making process. 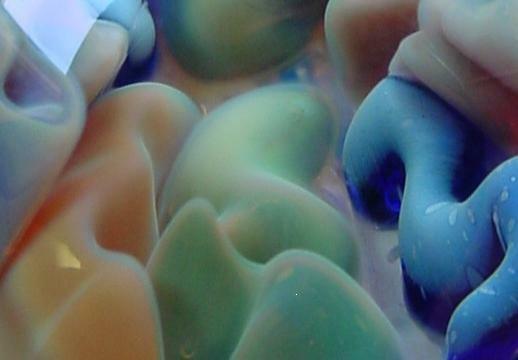 In 2000, I attended a seminar led by master borosilicate glass colorist Suellen Fowler. This opened up another world for me. Starting with this basic technical knowledge I developed a number of my own colored glass formulas, adding another degree of uniqueness to my work. Making colored glass is very time consuming and labor intensive. This knowledge has also helped me to better utilize the commercially available colored glass. Blown beads: 1 1/2“ diameter, 1 1/4" and 1 1/2“ diameter. The never ending creative and technical challenges of working with glass continue to inspire me. Since my college days I had always wanted to learn to make wire beads and jewelry. Some thirty years later I attended a basic wire bead making class in San Diego taught by Lynne Merchant. This skill has enabled me to combine silver wire with my large, hollow, blown beads to create jewelry pieces. I continued to visit southern California on a regular basis to hike in the Anza Borrego desert. I carried my small tool bag and silver wire on my many solitary hikes in the desert. It was the perfect environment, quiet and hot, for me to create wire componenets for my jewelry pieces. During my visits to southern California, I was also introduced to the world of seed beads. But it wasn't until a visit to Mystic, Connecticut that I began to work with seed beads. While Marcie was teaching a class at Laura McCabe's studio, Laura gave me a five-minute lesson in capturing a cabochon in a beaded bezel. This provided me a technique to be able to create pendent pieces using my glass cabochons and also gave me the basics of peyote stitch. About a year later I took a "Playing with Polygons" class from Diane Fitzgerald. This class covered the basics of using peyote stitch to create two and three dimensional geometric shapes using cylinder beads. This beading technique has been a perfect fit for me with my math and engineeering background. I was a juried exhibitor for 15 years at the Bergstrom-Mahler Museum Summer Art Fair (home of the largest representative paperweight collection in the world). In 2001 I was honored with the “Best of Show” award and in 2003 placed first in the 3-dimensional art category. I am a member of the Paperweight Collectors Association (www.paperweight.org). Marcie and I are members of the Portland Button Club, Oregon State Button Society (www.oregonbuttonsociety.org), the National Button Society (www.nationalbuttonsociety.org), and the Portland Bead Society (www.beadport.com). My work has been displayed at a number of galleries and museums in Wisconsin, Colorado, California, Minnesota, New York, Oregon, and Japan. At various times my work has been sold throughout the United States by a number of artist representatives. My pieces are in collections throughout the US, Scandinavia, Europe, South America, Japan and China. © 2011 Hanson Stone. All rights reserved.